This is an interactive piece, designed using my Configurative system for touch screen use by museum visitors. 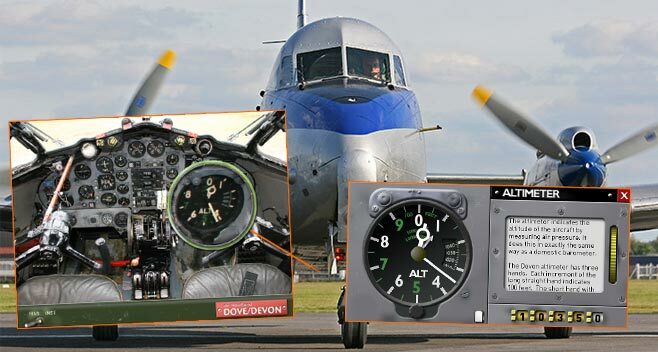 I took a high resolution photograph of the Classic Air Force Dove/Devon and used this as a basis for exploring the panel of a vintage twin-engined transport aircraft. It operates in a choice of two modes, chosen via an in-period switch at the bottom of the screen. In magnify mode the visitor can pass a magnifier over the panel to see instruments and controls in close-up detail. Flicking the switch to Instrument mode makes it possible to select controls and instruments and see a close-up with explanatory text. In many cases, the pop-up allows further interactivity. 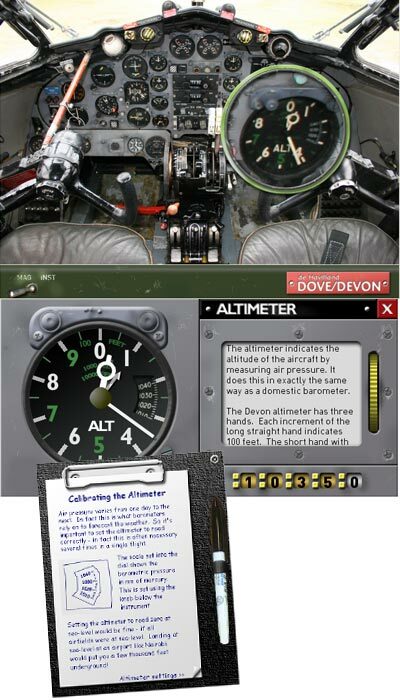 The altimeter, for example explains how to read the three-hand display and allows the visitor to select any height between 0 and the Devon's ceiling of around 20,000 feet. The screen updates to show this height as displayed by the vintage analogue dial. Many items also feature a "Kneeboard" that reveals further information or interactivity. In the case of the altimeter there's an explanation of how the altimeter is set for QNH and QFE advised by the tower. It's an entertaining piece with some surprising interactions. Selecting the turn/slip gauge opens the expected explanation, but then a tap on the kneeboard brings up a virtual yoke and rudder pedals. The visitor can then practise balanced turns, seeing the results of control movements on the gauge.